Chondroitin reduces pain and increases joint mobility. Quercetin helps increase the health of blood vessels, which carry oxygen and nutrients to muscle and joint tissue. Methionine relieves and prevents fatigue. Methylsulfonylmethane (MSM) helps support muscles and tendons in the body. Bromelain is a powerful anti-inflammatory and analgesic. 100% MONEY-BACK GUARANTEE - We are committed to our customers' satisfaction. If you're not satisfied with this product, we offer a 100% Money-Back Guarantee. Simply contact us directly for a full refund, no questions asked! HIGH-QUALITY, NATURAL JOINT SUPPORT & LUBRICATION - The high-quality ingredients used in our Glucosamine MSM supplement may help to maintain and improve joint health by reducing pain, inflammation and discomfort in those who suffer from joint disorders and joint pain in the lower back, knees, neck and SI joints. GLUCOSAMINE, MSM & CHONDROITIN SULFATE HEALTH BENEFITS - Glucosamine and Chondroitin Sulfate are naturally found in normal cartilage and help to stimulate healthy cartilage production. MSM (methylsulfonylmethane) has been shown to decrease joint pain and inflammation, while helping to improve mobility and flexibility - especially in those with joint disorders. 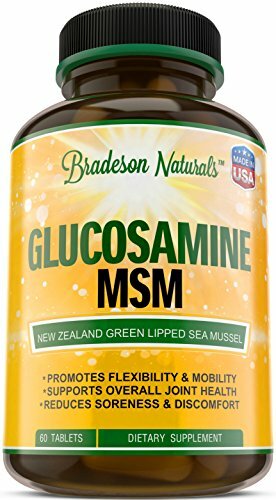 NEW ZEALAND GREEN LIPPED SEA MUSSELS: MAINTAIN CARTILAGE - Containing omega-3 fatty acids, New Zealand Green Lipped Sea Mussels are known for their anti-inflammatory properties, as well as connective tissue, cartilage and joint health benefits. They may also help relieve pain and discomfort in those with joint issues, while increasing mobility. NATURAL, NON-GMO & MADE IN USA - All Bradeson Naturals products are natural, contain no GMOs, are GMP-certified and are made in the USA in an FDA-approved facility. Our products also contain no binders, gluten, wheat, dairy, sugar, soy or hormones, so you can rest assured that you're receiving only the best ingredients. If you have any questions about this product by Bradeson Naturals, contact us by completing and submitting the form below. If you are looking for a specif part number, please include it with your message.